The Southern Ground-hornbill, one of South Africa’s iconic species, is sadly facing dwindling populations across the country. The decline is mainly caused due to anthropogenic threats, some of these include electrocution on transformer boxes, loss of habitat and suitable nesting trees, secondary poisoning, persecution for breaking window and lead poisoning. This, combined with the biological traits of the species, such as late maturity, slow breeding, only the alpha pair breeding, and being long-lived, further exacerbates their threatened status. The species quite frankly cannot breed fast enough, to compensate for current losses occurring due to these unnatural mortalities. 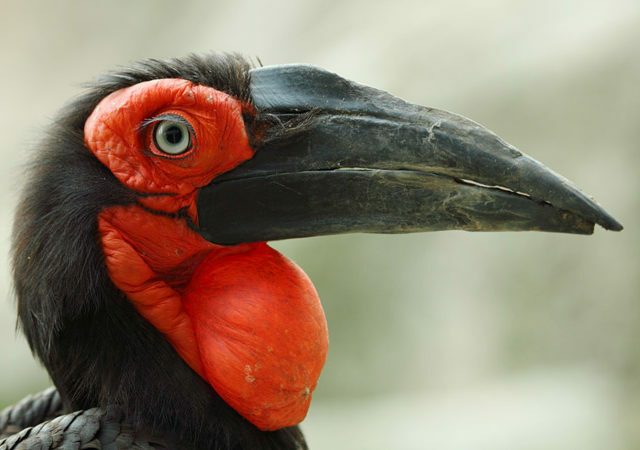 The Mabula Ground Hornbill Project aims to halt this decline, striving to establish new populations in areas where this species once flourished, but where it has since become locally extinct. One of the tools used in this conservation strategy, is the harvesting of second hatched chicks, which would have died naturally of dehydration/starvation in the wild, as the parents only rear the first chick if it’s healthy. This allows for surplus stock that can be incorporated into the conservation reintroduction programme. After the chicks are harvested they are transferred to a newly built facility, the Baobab Southern Ground-Hornbill Conservation Rearing Centre, especially designed for rearing good quality releasable stock. However, before any individuals can be released back into the wild it is vital to tag them, for monitoring best-practise. Currently two visual marking methods have been incorporated: the first is the ringing of individuals with colour coded rings, and a stainless steel SAFRing containing a unique number. Ringing brings with it some threats though: coloured rings fade rings fall off and there is always the risk of injury from the rings. Tattooing is now being explored as an alternative. The Mabula Ground Hornbill Project is responsible for keeping good records of each individual harvested, as it is the Project’s responsibility to report back on their whereabouts and success of the program, to the organisations where the chicks originated from. This necessitates high quality identification techniques such as the use of microchips (passive integrated transponders), such as those provided to the Project by Identipet. Microchips are ideal being a permanent method of electronic identification, each with a unique code, easily detected by making use of a microchip scanner. This method is less invasive then surgical implants, and is easily inserted subcutaneously. Birds do not need to be placed under anaesthesia, or given analgesics for this procedure and can easily be completed by a vet in just a few minutes. This allows for life-long identification. In the event of a carcass being collected it can be scanned for a microchip and provide valuable feedback to researchers, which can be applied in adapting conservation strategies for the species. Equally important is to mark captive stock as not all birds are eligible for release. However, good management of the captive breeding stock is of equal importance to the programme. Once birds have reached sexual maturity it can become very difficult to identify individuals visually. Microchips can help keepers ascertain who is who in their collection and enable good record keeping. Microchips assist in keeping good record of ex situmovement of birds between institutions, as regular health checks and veterinary care is provided, where scanning for microchips forms part of general practice at most institutions. Thus utilising microchips in the conservation programme of Southern Ground-Hornbills, have proven very beneficial, and we thank Identipet for their contributions in the conservation of such an enigmatic species.